A month after admitting that it was deliberately broadcasting lower-resolution video to AT&T and Verizon wireless users, Netflix has introduced a new tool that will let users around the world choose how much of their data plan they want to blow through binge-watching House of Cards. 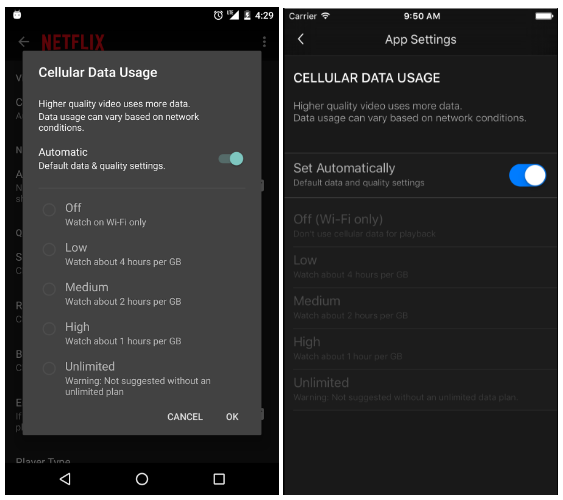 Earlier today, Netflix announced an updated version of its iOS and Android apps that includes a new “Cellular Data Usage” setting that allows users to decide for themselves how much data they spend on movies and tv show viewing . Under the new setting, Netflix customers can switch off the default setting — which allows users to stream about three hours of content per gigabyte of data — to a usage amount that better fits their preferences and available data. Netflix says it came to the default setting after testing found that, on cellular networks, this level provides a balance of good video quality with lower data usage to help avoid exceeding data caps and incurring overage fees. For customers who have a more robust data plan (or no data cap at all), Netflix will allow them to adjust the setting to stream higher bitrates. On the other side, those with a lower data cap can choose to stream at a lower rate. “Our goal is to give you more control and greater choice in managing your data usage whether you’re on an unlimited mobile plan or one that’s more restrictive,” Eddy Wu, director of Product Innovation at Netflix, said in a statement. To set your cellular data usage, got to “App Settings” on the Netflix app, pick “Cellular Data Usage,” and switch off the automatic default setting. Then choose between an unlimited, higher, or lower usage setting that best works with your data plan. The new option comes a month after Netflix admitted that it throttled its own streams on AT&T and Verizon networks because of data caps. For five years, Netflix says it capped its own mobile data streams at 600 Kbps on most wireless networks around the world. According to the company, the throttling was justified: If you hit your data cap and get socked with overage fees you won’t be watching any more Netflix this month — and you might cut back in future months, too. Therefore, in the interest of keeping customers watching and subscribing, they throttled the streams. Previous Is The “Sharing Economy” Sharing Your Data With Law Enforcement?